From gender point of view, Bakiev’s administration failed at the very beginning. One year after the presidential elections, Roza Otunbaeva criticized Kurmanbek Bakiev and new government member for "polygamy fashion". "Many officials and businessmen have two or three wives – said the co-Chairman of Asaba opposition party- From gender point of view, Bakiev’s administration disrespects political history of Kyrgyzstan…"
At the first "Bakiev’s" parliament cancelled constitution rule that granted Kyrgyzstan the status of secular state in order to, in the opinion of NGO women, open the way for Sheria law. In spring of 2007 the parliament discussed the prohibition of article 153, Criminal Code, assuming 2 year imprisonment for polygamy. Mobilizing the resources, the non-governmental organizations managed to oppose the parliament. Later on, the discussions were initiated again. "First of all, from legal point of view, the polygamy is not a crime – said the Justice Minister Marat Kaipov – This article was approved in USSR for Central Asian republics only. In Baltic states, for example, there was no such article. Secondly, many wealthy men de facto illegally have wives. Third, Kyrgyzstan is the only republic in post-Soviet area with such legal norm". All media and other resources were employed against the Justice Minister by the human rights defenders: they organized discussions, round tables, conferences. They were even supported by some Muslim clerical leaders. The cancelation of this article was interpreted by the human rights advocates as the attempt of officials to safeguard themselves from possible lawsuits for polygamy. The NGO leaders said they will demand open and nominal voting over 153th article. The parliamentary parties pulled back. In the interview at national television channel the prominent human rights activist Aziza Abdurasulova mentioned that besides one official wife President Bakiev had other two wives. That was a strong kick. Kurmanbek Bakiev has not directly responded to accusations. He was careful enough, not involving too much in the initiative of Justice Ministry. "There are more serious issues in Kyrgyzstan than the discussion of polygamy and they need the involvement of women", he said. Bakiev was doing his best to prove the image of family man. He gladly talked about two sons – Marat (the former deputy head of National Security Service) and Maxim (the manager of financial sector of national economy) – wife Tatiana whom he met during studies in Kuibishev (Samara). Allegedly, the elder son was involved in special anti-terrorist operation in Batken while the younger one was the financial guru. Bakiev never publicly spoke about two wives and kids although there were various rumors in the republic. For example, he married Kyrgyz woman because Kurmanbek’s mother was not satisfied with Tatiana, ethnic Russian. 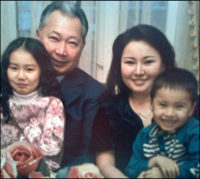 The details about third family (wife, 5-year old son and 9-year old girl) became available after his arrival to Belarus. At the moment, Bakiev is not incriminated polygamy charge. Considering other charges, this one does not look too important. Besides, it is difficult to prove the presence of few wives without statements, submitted by offended women.